COSSA has also announced that the 2017 recipients of the COSSA Distinguished Service Award will be Senators Gary Peters (D-MI) and Cory Gardner (R-CO), in recognition of their work on last year’s bipartisan science and innovation legislation. COSSA will present Senators Gardner and Peters with the award at a Congressional reception as part of the conference on March 29. Other confirmed speakers include John Sides of the Washington Post’s popular Monkey Cage blog, who will speak about how to bring social science to the masses. Planned sessions also include panels on strategies for enhancing student participation in the social sciences on campus and best practices for social and behavioral scientists engaging with the media, among other topics. Register today! Remember, participants affiliated with COSSA member organizations are eligible for discounted registration. Email jmilton@cossa.org for details. Registration is now open for the 2017 COSSA Science Policy Conference and Social Science Advocacy Day, scheduled for March 29-30 in Washington, DC. This event (formerly the COSSA Annual Meeting) brings together COSSA members and other stakeholders for a day of discussion about federal policy impacting our science followed by the only annual, coordinated advocacy day in support of all of the social and behavioral sciences. Come be part of the action. Register before January 15 to receive the early bird rate. Information on discounted student rates and confirmed speakers will be released in the coming weeks. Register today! COSSA held its 2016 Annual Meeting on March 15th in Washington, DC. Meeting sessions focused on topics like congressional attacks on federally-funded research, social science and the media, use of social and behavioral science in industry, and how to communicate the value of social and behavioral science research. In addition, participants heard updates on activities at federal agencies, including the National Science Foundation, National Institutes of Health, National Institute of Justice, Environmental Protection Agency, and Bureau of Labor Statistics. Click here to read COSSA’s summary of the meeting’s sessions. You can also check out our social media recap, which covers both the Annual Meeting and Social and Behavioral Science Advocacy Day. 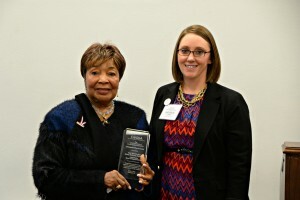 On March 15, as part of COSSA’s Annual Meeting and Celebration of Social and Behavioral Science reception, COSSA presented the 2016 Distinguished Service Award to Congresswoman Eddie Bernice Johnson (D-TX). Congresswoman Johnson was recognized for her “unwavering support for social and behavioral science research and steadfast leadership on behalf of the U.S. scientific enterprise.” In accepting the award, Congresswoman Johnson reaffirmed her commitment to all disciplines of science and resolved to continue to ensure that social science receives the support it deserves. On March 16, about 50 social and behavioral science researchers, stakeholders, and advocates met with their Members of Congress to advocate in support of fiscal year (FY) 2017 funding for federal agencies and programs that support social and behavioral science research. Despite the system-wide shutdown of the DC Metro, advocates from 14 different states made it to Capitol Hill to discuss the value of this research and why it is in the national interest. Materials used to help articulate these messages can be found on the COSSA website, including fact sheets on COSSA’s FY 2017 funding requests. Preview of the COSSA Annual Meeting, March 15-16 – Still Time to Register! The COSSA Annual Meeting is just one week away. The agenda includes a wide range of topics impacting social and behavioral science research, from federal funding and the media’s use of social science research, to communicating science and industry interests. There is still time to register! Remember, if you belong to COSSA member organization, you are eligible for a discount. Contact Julia Milton for the discount code. More details on the COSSA Annual Meeting page. There’s Still Time to Register for the 2016 COSSA Annual Meeting on March 15-16! A near-final agenda for the 2016 COSSA Annual Meeting is now available. Check out our excellent lineup of speakers and register today! Remember, if you work for a COSSA member organization, you are eligible for a discount. Contact Julia Milton for the discount code. Preliminary Agenda Released for COSSA Annual Meeting; Rates Increase February 15! Registration rates for the 2016 COSSA Annual Meeting and 2nd Annual Social and Behavioral Science Advocacy Day on March 15-16 will increase on February 15. In addition, the hotel block for out-of-town attendees closes on February 15. Register and make your reservation today! Note: Individuals who work for COSSA member organizations are eligible for a members-only registration rate. Email jmilton@cossa.org for details on how to get your member discount. A preliminary agenda for the meeting is now available. Several sessions are still under development—check back soon for a complete listing of speakers and topics. ABOUT THE COSSA MEETING – The COSSA Annual Meeting brings together representatives from throughout the social and behavioral science community for a day of discussion on federal issues impacting social and behavioral science research. It provides an opportunity for COSSA members to engage directly with leaders of federal science agencies, Congressional staff, and colleagues from other associations and institutions. This year, discussions will highlight the many ways social and behavioral science research serves the national interest. Come be part of the conversation. Registration is now open for the 2016 COSSA Annual Meeting and 2nd Annual Social and Behavioral Science Advocacy Day scheduled for March 15-16, 2016. Click here to register today! Registration fees will increase in February. Individuals who work for COSSA member organizations may be eligible for a members-only registration rate. Email jmilton@cossa.org for details. Visit the COSSA Annual Meeting page for full details, including discounted hotel rates for those traveling to the meeting (reservations must be made by February 15!). The COSSA Annual Meeting brings together representatives from throughout the social and behavioral science community for a day of discussion on federal issues impacting social and behavioral science research. It provides an opportunity for COSSA members to engage directly with leaders of federal science agencies, Congressional staff, and colleagues from other associations and institutions. This year, discussions will highlight the many ways social and behavioral science research serves the national interest. Come be part of the conversation. CONFIRMED SPEAKERS: So far, we have confirmed speakers from the National Science Foundation, National Institute of Justice, and the National Academy of Sciences, with much more in the works. COSSA’s 2nd Annual Social and Behavioral Science Advocacy Day will take place on Wednesday, March 16. This event provides COSSA members with an opportunity to meet with their Congressional delegations to discuss the value and importance of social and behavioral science research. Representatives from all COSSA member organizations are encouraged to participate. Training and all materials will be provided to members. COSSA will hold its 2016 Annual Meeting and Social and Behavioral Science Advocacy Day on March 15 and 16 in Washington, DC. The meeting brings together more than 100 members of the social and behavioral science community and provides a platform for COSSA members to engage with leaders of federal agencies, Congressional staff, and colleagues from across the science and higher education communities. The meeting on March 15 will take place at the George Washington University Marvin Center and will feature updates from leaders at federal science agencies and panels highlighting issues impacting the social and behavioral science community. 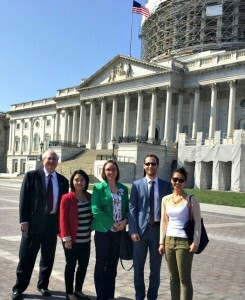 On March 16, COSSA members will take to Capitol Hill for Social and Behavioral Science Advocacy Day. They will have the opportunity to meet with their congressional delegations in the House and Senate and educate staff about the importance of federally funded social and behavioral science research. Keep an eye on COSSA’s annual meeting page for more details as they become available. Early bird registration will open in December.